Early in the fall choral season, rehearsal is still a grappling match between the singers and the composition, an exercise in musical sausage-making in fits and stops, which the audience will never see. Crowded on chairs behind the altar at St. Mark's Episcopal Church in Foxborough, the Neponset Choral Society is battling with Gabriel Fauré's Requiem, a challenging piece of church music written more than 100 years ago. Barely 10 seconds into rehearsal, the group's artistic director, Michael V. Turner, is already interrupting to correct the pace. "It's going to be hard to find the pulse in this," he says. At times during the 2 1/2-hour session, the requiem is within their grasp, and the results are stunning. The music reels from somber to swelling, from inspiring melancholy to raising goose bumps, like theme music for the Resurrection. 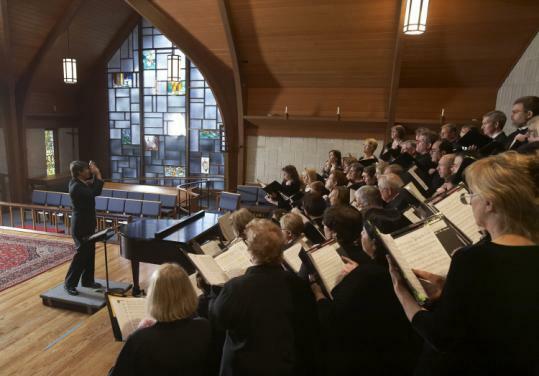 Now starting its 60th season, this amateur chorus has maintained its traditions, practicing throughout autumn to wrestle pieces like the Fauré Requiem into submission, in time for concerts in December. The membership includes men and women, ranging in age from early 20s to the mid-70s. Drawing singers from some 20 towns in the region, the society has endured since 1949 due to the quality of the music, members say, and because community chorus provides relief from family troubles, ill health, and, these days, the tough economy. "I come out of rehearsal every Monday night just feeling so much better than when I came in," said Jeanie Mattila, an alto from Wrentham, in her 21st season with the group. "It makes everything else in your life enjoyable," said Kathy Labriola, a retired nurse from Franklin. The 60-member ensemble is expected to be ready to perform the requiem and other works at two concerts, Dec. 13 and 14, at St Mark's. The group will pick up rehearsal again in January for its spring season. Turner has directed the group since 2003. He is a graduate of the Boston University School of Music and holds a master of music degree from the Longy School of Music in Cambridge. He is the director of music at the Noble and Greenough School in Dedham. "Michael is exceptional," says Rue Siegel of Norton, an alto who joined the chorus in 1978. "He's very precise, but he's very laid back. He never gets mad." Turner ends the first portion of rehearsal on a dramatic chord and pauses to let the sound die out in the corners of the church. From there the chorus splits up: Turner takes the basses and tenors to the basement for specific instruction. The chorus's assistant director, pianist Linda Jiorle-Nagy, works with the altos and sopranos. Her style is snappy and kinetic. She stomps, claps, snaps her fingers, banters with the singers, and laughs. Jiorle-Nagy holds a doctorate of musical arts in piano performance from Boston University. She teaches piano at BU and at Brown University. The chorus, she says, is like a very large family. "And after a while you get to know the people quite well and you listen to some of their stories, some of the happiness in their lives, some of the sadness, the sicknesses, and the deaths in the families, and you become more a cohesive unit, not just singers, but friends. And it binds people together." The ensemble's roots reach back to East Walpole in 1949, and to a maker of roofing materials called Bird & Sons, says Diane Bellissimo, president of the choral society's board of directors, a singer in its alto section, and the niece of the group's first music director, Leonard Weaver. At its founding, the Bird Club chorus was for employees, but soon broadened its membership to the general public and was renamed the Neponset Choral Society. In its early years, the society performed a lot of Gilbert and Sullivan, but moved to more traditional choral productions, says Turner. "We'll do some things that will be familiar to the singers," he says, "and we'll do some things to stretch them, too."